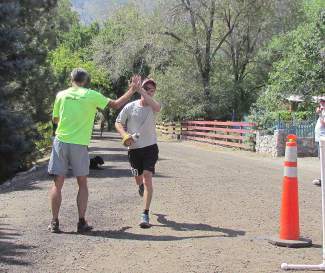 Paul Sweeney of Truckee receives a high-five at the finish line Saturday as he wins the second annual Genoa Peak Madathon. Keeping with his familiar routine, Paul Sweeney ran without a watch Saturday during the second annual Genoa Peak Madathon. Sweeney did know two things while he was out on the marathon course. First and foremost, that he felt strong. And second, he was running out in front of the field. Nobody ever caught up, either, as the 48-year-old Truckee runner went on to win the “Completely Mad” marathon race in a time of 4 hours, 43 minutes and 58 seconds on a 26.2-mile course that led from Genoa to the top of 9,150-foot Genoa Peak and back. Without a watch on his wrist, Sweeney wasn’t exactly sure what pace he was running on the trail. “I usually don’t wear a watch,” he said. “I like to run by how I feel and not worry about my time. I felt better this year, so I was happy about that. “And, I placed better than I did last year,” he added, flashing a big grin. Sweeney finished second last year at the inaugural Madathon in 4:21:55. John Fitzpatrick won the race in a time of 4:15:25 that stood up as the course record. Betsy Nye, 49, of Truckee repeated as the women’s winner and finished seventh overall in 5:42:32, more than six minutes faster than her time last year. Karyn Dulaney, 32, of Finksburg, Md. was the second woman to finish in a time of 5:57:20. Andy Szeto, 41, of Sparks was the second overall finisher in 4:47:14. Szeto, who was coming off a fifth-place finish just three weeks before at the Tahoe Rim Trail 50K, led Sweeney by 18 seconds at the mid-mountain aid station and reached the top of Genoa Peak in 2:51:41, three seconds ahead of Sweeney. “We were going back and forth,” Sweeney said. Mark Atkinson, 48, ran 4:53:31 to edge Kevin Peterson by two seconds for third-place. Atkinson improved his time on the course by 67 minutes. Gardnerville’s Jim Nelson ran 5:17:06 to place sixth overall, an improvement on his time of 25 minutes from last year. A total of 18 runners finished the marathon and 41 finished the half-marathon during an event presented by Ascent Runs. Race director Kevin Bigley expressed words of gratitude to the Carson Valley Trails Association for its work after a series of recent rain storms. Stephen Avillo, 39, of Reno led a record-setting assault in the half-marathon as he ran 2:02:16 to win a race in which the top four finishers surpassed the previous course record. It marked his first attempt racing at the 13.1-mile half-marathon distance and he ran more than two minutes faster than the previous course record of 2:04:56 Jason Tollmann set last year. Minden’s Tim Dry repeated his second-place overall finish as he ran 2:03:29. Dry’s time marked an improvement of nearly seven minutes from last year. Avillo was the first runner to reach the top of the course (6,300 feet) in a time of 57:55, while Dry was close behind in 58:37. Sara Poindexter of Reno was the first woman to finish and fourth overall runner in 2:04. Her time set a women’s course record and was faster than the previous overall record. David Norvell was the third-place overall finisher in 2:04:05.